Recent publicity about the problems that have arisen with some types of metal on metal hip replacements (MOM hips) has generated a great deal of worry among people who have received this type of hip prosthesis. Some of this worry has been generated unnecessarily. Only one in six people in the UK who has had a hip replacement has a metal-on-metal hip according to the British Joint Registry, and only some of them may eventually cause problems. However, evidence is coming to light that some types are causing concern, and orthopaedic specialists are recommending that people with MOM hips do get regular checks, even if they feel fine. What are metal on metal hip replacements? Cobalt-chromium alloy has been used for orthopaedic implants since the 1920s, however, it is only since the 1990s that this alloy has been used for both surfaces of widely used hip implants. Someone who has a hip replacement in their late 50s may live for another 40 years, and artificial hips can fail due to wear and tear. Producing a hip joint that can last a lifetime has therefore been an important goal of orthopaedic research. Since 1997, younger patients have had the option of metal-on-metal hip resurfacing. As the name suggests, both the ball and socket of the new joint are made of metal, a combination of cobalt and chromium, and the two inert metals have been used without problems for years and there was a lot of optimism that these hip replacements would last without problems for 30 years or more. That made them a popular option and in 2009 over a third of all hip replacement surgery in the USA made use of metal-on-metal hip prostheses. In total between 1997 and 2011, around a million people worldwide were given this type of hip replacement. Why have some metal-on-metal hips been recalled? Problems have been identified in some of the patients who were given metal-on-metal hips made by DePuy, and the Medicines and Healthcare Regulatory Agency (MHRA) here in the UK took action towards the end of 2010. They were the first regulatory agency in world to take action and the data supplied by the UK National Joint Register (a register of all hip and knee replacements carried out in England and Wales since 2003) was instrumental in their decision making. The MHRA alerted doctors and patients to its concerns and this led to a recall of the DePuy ASR hips, which had been fitted to around 100,000 people. 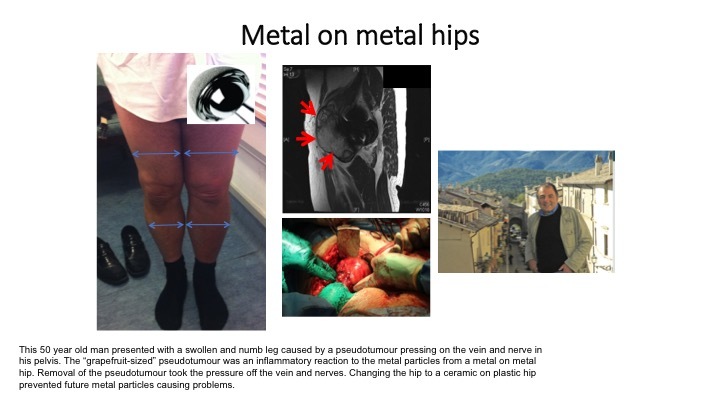 We don’t yet have enough evidence to be able to say whether it is only this type of hip prosthesis that can cause problems, and research is in progress to find out more about how all types of metal-on-metal hip replacements behave over time. However, the UK National Joint Register and the MHRA are continuously monitoring the situation. This is a relatively rare problem; it is more common in women than men but we don’t yet understand why. In many of those patients who are affected, the metal-on-metal hip replacement wears out unusually quickly, causing obvious symptoms such as pain and lack of mobility, usually prompting a hip revision operation. In others, the wear is minimal but their tissues are susceptible to small doses of metal particles. For cases of accelerated wear rate, the problem is either a result of the original positioning or manufacturing quality of the prosthetic metal joint. Research has shown that the angle of placement is a major factor. Obvious wear and tear in a metal-on-metal prosthetic joint is minimal in most patients but it has been realised relatively recently that the constant friction between the two metal hip components that occurs during movement releases metal particles. These are only a few nanometres in size, which means they can only be seen with a powerful electron microscope, but the body’s immune system may be able to detect them, and some people with metal-on-metal hips develop a clinically significant inflammatory response. However, it is not known whether the particles or the cobalt and chromium metal ions released from the particles are responsible for the inflammatory response. The inflammation can lead to tissue damage around the joint, something that has been observed in some patients fitted with the DePuy metal hips. However, the metal nanoparticles can also travel elsewhere in the body, as they are easily carried in the blood system. At the moment, we do not have any data to show what effects this may have. Recent media reports have suggested a link with bladder cancer but the study in question, done by researchers in Bristol, only looked at 71 patients with MOM hip replacements; they found that one of them had early stage bladder cancer but this patient was also a heavy smoker (smoking is associated with bladder cancer). A larger study presented at the same meeting by a separate group of researchers from Newcastle found no increased risk of bladder cancer in 723 patients who had metal-on-metal hip replacements, who were followed up for between six and 14 years, longer than in the Bristol study. Both studies were discussed at a meeting of the British Hip Society but have not yet been subjected to the scrutiny of peer review, which is required before publication in a scientific journal so it is really far too early to know whether the findings of either of them are reliable. Orthopaedic surgeons want to see more studies and do more investigation to find out if metal ions that travel around the body can lead to wider health risks beyond the hip joint. What do I do if I have had a metal-on-metal hip replacement? It is not yet known how many patients are likely to be affected, or how to accurately identify those most at risk. This is why orthopaedic surgeons such as Prof Hart are erring on the side of caution and recommending that patients should be assessed and then given regular checks. There is no need to panic, an assessment should be done within weeks if the patient has significant hip pain that affects their mobility, or within 6 months if the patient has no pain. Prof Alister Hart leads a group at the Royal National Orthopaedic Hospital, Stanmore that trains surgeons across the UK and beyond to recognise the signs that something is wrong in patients with metal-on-metal hips. He is also one of the few surgeons who is experienced in the less-than-straightforward surgical procedure required to revise a failed MOM hip. His multi-disciplinary team has been assessing patients with MOM hips for 7 years and has seen NHS and private patients from Scotland, Wales, Northern Ireland, Northern England and the west country. “Results from the specialised tests are discussed with radiology experts Keshthra Saatchithananda, Adam Mitchell and fellow orthopaedic surgeon Angus Lewis and the data collected has been used to increase our knowledge of how to best to manage these patients,” he explains. The group recently presented 12 papers on this subject at the American Academy of Orthopaedic Surgeons, attended by 40,000 delegates. “Even if you are having no pain, no mobility issues and you are feeling absolutely fine, it is important to see your GP at some point over the next year so that you can be referred for tests. You may need regular monitoring and if you have signs of inflammation, then you will need to discuss this with your surgeon and perhaps choose to have an early hip revision,” says Mr Hart. A 3D CT scan: this can identify the exact angle of your hip joint, and flag up if the hip’s position is likely to accelerate wearing. This is considerably more accurate and precise compared to normal xrays. Blood tests to measure the levels of cobalt and chromium metal ions. People with a high blood levels of cobalt or chromium are thought to be most at risk of inflammatory changes and hip failure. However, this test will only pick up half of the potential failures, therefore it is not yet recommended for screening. A special MRI scan to examine the muscle and soft tissues around your metal-on-metal hip to detect signs of inflammation. This metal artefact reduction sequence magnetic resonance imaging (MARS MRI) is the only way to do this reliably. It has many advantages over ultrasound: it is good at picking up muscle problems; it is less dependent on the operator performing the scan; it offers more reliable diagnosis of other non-hip related conditions such as those that occur inside the pelvis. Finally, MARS MRI offers the opportunity to compare scans taken previously or in the future and allows the scan pictures to be shared easily with other radiologists, such as those with specialised experience in this field. If you have no symptoms, and these tests show nothing obviously wrong, you will then still need annual checks to make sure any problems that appear in the future are picked up quickly. It may be possible to do some of these by telephone, internet or correspondence but for now it is recommended that this involves a visit to see your orthopaedic surgeon. You should not be unduly concerned; there is no need for you to think about hip revision at this stage. As well as assessing and treating patients already identified as having problems with their metal-on-metal hip, in 2007 Prof Hart and his colleagues at the Royal National Orthopaedic Hospital set up the London Implant Retrieval Centre. This is collecting MARS MRI results and blood test results from patients throughout the world, together with their metal hip once it has been removed. “We are collecting masses of data to find out more about what happens in the body when a MOM hip fails, so that we can provide reassurance and the most effective treatment strategies possible,” he adds. The track record in research and independence of the centre meant that it was also chosen by Depuy in 2011 to perform independent analysis of failed ASR hips. Lawyers acting against Depuy in the US approved the international standards used by the centre so that reports can be used by patients, surgeons and lawyers to assist in compensation claims from Depuy. The centre does not undertake medico-legal work for or against Depuy regarding the ASR hip.